6 years ago by Pomona College Exterior view of the Harwood Hall of Botany with Mason Hall in the background. Harwood was built in 1915 and demolished in 1968. Although sensitive to the community’s fondness for the Claremont Inn, the trustees ultimately decided the building should be demolished after a feasibility study indicated that renovation would be impractical. 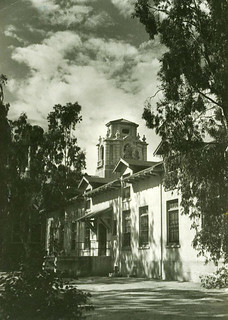 It was razed in July 1968, after 62 years of service to the College and city. Plans to build a new inn were ultimately abandoned, and the site remained empty until the arrival of The Seaver House in 1979. 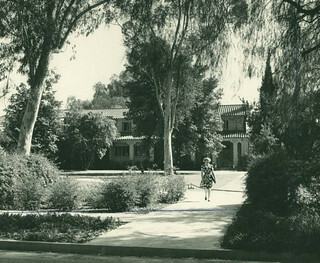 Harwood Hall for Botany was quietly demolished in 1968. Reflecting, perhaps, its undistinguished character, there is little record of Harwood Hall in Pomona’s archives. Thought it was part of the campus for more than half a century, having been built in 1915, it can be glimpsed in only a handful of remaining photographs. Students voted overwhelmingly to preserve the Wash by prohibiting motorcycles and cars. The gates allowing access to vehicles were locked, with the area open only to pedestrians. A year after the first language residents for French, German and Spanish were hired to live alongside students in the language halls of the Oldenborg Center, the College added its first language residents for Chinese (Diana Wen) and Russian (Petr Brandeisky). In February, 79 students, 49 of them from Pomona, occupied the College’s Placement Office to protest the presence of two Air Force recruitment officers. Later in the year, about 80 students assembled on Alumni Field where the annual Presidents’ Review and Award ceremony of the R.O.T.C unit of Pomona and Claremont Men’s College was to be held. After being advised they were engaged in an obstructive demonstration, all but five students left. In the fall of 1968, student living at Pomona became “co-educational” when 59 men became residents of previously all-female Blaisdell Hall and 58 women came to live in previously all-male Walker Hall. About two-thirds of Pomona freshman rejected disruptive student activism in a poll sponsored by The Student Life. The first-year students also approved of the legalization of marijuana, supported busing to gain racial balance and supported Richard Nixon in a four-way race for president. In December, Black Panther Bobby Seale spoke a capacity crowd at Bridges Auditorium. A young Kurt Russell played a college student in The Computer Wore Tennis Shoes, part of which was filmed at Pomona in 1968. With help from the Rockefeller Foundation, The Claremont Colleges raised $2,000,000 for a program of studies for men and women from economically disadvantaged backgrounds. The Program of Special Directed Studies for Transition to College brought 40 students to The Claremont Colleges, including 12 to Pomona. The presidents of the six Claremont Colleges reaffirmed the rights of dissent, non-obstructive protest, free movement and other aspects of academic freedom, but also reserved the right to suspend students of any Claremont college who engaged in an obstructive protest on campus. The Claremont Colleges began testing a plan permitting any student to eat at any dining hall on the Claremont campuses at no extra cost. Students needed to make a reservation at least one day in advance. Myrlie Evers-Williams ’68 moved to Claremont with her three children after the assassination of her husband, civil rights leader Medgar Evers. While still a student at Pomona College, Ever-Williams wrote For Us, the Living, which chronicled her late husband's life and work. She was the first black woman to serve as head of the Board of Public Works of Los Angeles and, in 1995, became the first woman to head the NAACP. Her autobiography, Watch Me Fly: What I Learned on the Way to Becoming the Woman I was Meant to Be, was published in 1999. Martin Luther King Jr. and Robert Kennedy were assassinated. President Lyndon Johnson signs the Civil Rights Act of 1968. On Christmas Eve, Apollo 8 becomes the first manned spacecraft to orbit the Moon.